This is the third post in a three-part series where I explain how to create a Summer-Fill Direct Mail Campaign that can be used to increase your customer base and help sell more propane. In part one of the series, I provided some background and explained the advantages and benefits of direct mail marketing. In part two, I explained why it’s important to have a specific goal for your direct mail campaign and how to design and print your marketing piece. In this third and final part of the series I’ll review mailing costs and give you the steps required to prepare your piece for mailing. You’re now at the point in your direct mail campaign that you need to make some choices. You’re sending a postcard so it’s pretty obvious that we’ll be using the U.S. Postal Service (USPS) to get them delivered, but there are other aspects affecting mailing costs that you need to address. The choice that will most affect cost is related to whether you want to address each piece. If you choose to address each one, you’ll need to buy a mailing list. Mailing lists cost as little as $0.10 per name or as much as $0.50 per name depending on the quantity of records and the number of demographic criteria selected. Assuming a mailing of 5,000 pieces, you could spend as little as $500 or as much as $2500 for a list. Addressed mailers also require more sorting at the post office and that means higher postage rates. You can get discounted postage for an addressed bulk mailing, but you’ll still be looking at about $0.30 per postcard ($1500 in postage for 5,000 pieces). For some, the additional costs of a mailing list and postage are worth the personalization that an addressed piece provides. An alternative to mailing addressed pieces is something called a “saturation mailing”. With a saturation mailing, the mail carrier will deliver your postcard to every household in a specific area that you select. Rather than a name and address, the address block will read “Local Postal Customer”. There’s no need for a mailing list and since it’s not addressed, there’s no sorting involved and postage rates are much less. Postage on a saturation mailing runs about $0.20 per postcard ($1000 for 5,000 pieces). For this Summer-Fill mail campaign, I recommend that you try a saturation mailing. It’s a good first step into the world of direct mail marketing and will keep your costs to a minimum. The USPS has developed a service to help with your saturation mailing called “Every Door Direct Mail” (EDDM). With EDDM you can send up to 5,000 pieces per zip code per day, no names and addresses are needed, and you can further reduce your postage to $0.175 per postcard ($875 for 5,000 pieces). That’s a far cry from the $0.49 stamp we all pay for a first class letter. Determine the mailing area. We had previously said the goal of the campaign is to expand service territory. Using the EDDM carrier route search tool, you will select mail carrier routes in your new service territory target area. Once you’ve made your selections, you can total up the households in those carrier routes and that will give you the number of postcards needed. Remember in Part 2 of this series we said the goal of this campaign was to add 150-200 customers. You can expect to turn about 2% of the mailed households in to customers. So you should plan on mailing 7500-10,000 postcards to meet that goal. You can also take that total and multiply it by the $0.175 to determine your total postage cost. You should seriously consider doing more than one mailing to your target area. If you decide to do three mailings, simply take the number of households in the target area and multiply by three to get the number of postcards required and a budgeted postage amount. NOTE: There are some size and format requirements for EDDM postcards. Make sure that whoever is doing your postcard design is aware of those requirements and check to be sure all have been included prior to getting the postcards printed. Prepare documentation. The USPS requires some forms to be completed for an EDDM mailing. The forms are not hard to complete and are all available on the EDDM website. If you’d prefer to have someone help you with the forms, check with your local printer or a nearby mail service center and see if they provide the service. Bundle your pieces. 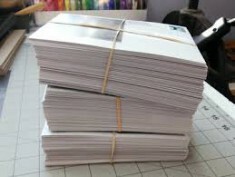 The EDDM program requires that your postcards are bundled by carrier route and in groups of 100 or less. A local printer or mail service center can also help with this. Take your bundled postcards and completed forms to the post office. Once you’ve handed off the postcards and paid the postage, the post office will take care of the rest! Prepare your staff. Your postcards will start arriving at homes within 24-48 hours after you have delivered them to the post office. Don’t be surprised if the phone starts ringing the next day. It’s smart to prepare whoever will be answering the phone with responses to anticipated questions. The person handling calls should inquire about the location calling from and verify that the caller received the postcard. That and other information collected will determine response rates and will help you refine your direct mail marketing strategy going forward. Of course, don’t forget to ask the caller when they would like their first delivery of propane! Again, I recommend that you do multiple mailings. Repeat mailings to the same target area will help to build your brand identity and credibility. Wait two or three weeks after the first mailing and send a second mailing. Give it another two or three weeks and do a third mailing. You can use the same postcard layout for each mailing or design and print something new. Don’t forget to track results and response rates from each mailing. That concludes this three-part series on how to create a Summer-Fill Direct Mail Campaign that can be used to increase your customer base and help sell more propane. Feeling overwhelmed? Seem like more trouble than it’s worth? As with anything new, there’s a learning curve, but I think you’ll find the results are worth the effort. If you have any questions or want more information, feel free to comment on the post, email or call toll free 800-632-2038.